Question: What does becoming the most successful guitar teacher in your area and climbing to the top of Mount Everest have in common? 1. Very few people in the world have fully reached either goal (out of tens of thousands who attempted it). 2. Every person who has attempted to climb to the top of Mt. Everest ‘without training’ has either failed or died. The ONLY people who ever made it to the top are the ones who had the right training to make it. Likewise, guitar teachers who attempt to build their businesses without any guidance or proper training will also fail… while the ones who become hugely successful virtually always had expert training in how to do so. More on this below. 3. Reaching the top of Mt. Everest is truly a life-changing moment, giving you the fulfillment of a lifetime that few people on this Earth will ever experience. Likewise, building your highly successful guitar teaching business gives you a similarly exhilarating level of fulfillment and freedom. Having a dominating guitar teaching business enables you to create the life that you want for yourself while helping hundreds of guitar players to reach their musical goals. The average person never even comes close to experiencing this level of fulfillment and success. What Does This Comparison Have To Do With You As A Guitar Teacher? From now on, I want you to visualize reaching your ultimate goals in your guitar teaching business like climbing Mount Everest. At the top of this (proverbial) Mt. Everest is a golden box. The box contains the ability to reach any possible goals you have set for your business, such as: a 6-figure income from teaching guitar, the ability to transform your guitar students into amazing musicians and the kind of freedom that only having a successful business can bring you. If you knew that all you had to do is climb this mountain and that the box would be waiting for you there (with the benefit(s)/goal(s) inside) and you had the key to open it, would you climb that mountain? If your answer is ‘yes’, then you need to do everything possible to make sure you reach the top of your ‘guitar teaching mountain’ as quickly as possible. That said, no sane person would attempt to climb Mt. 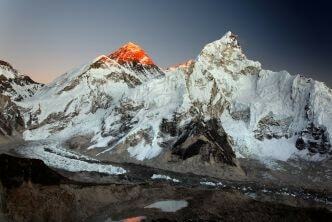 Everest without training and expect to reach the top. Doing so would be a near-certain suicide. Likewise, starting to build a guitar teaching business from scratch without training will cause you to fail in much the same way. Why Do Guitar Teachers Without Training Fail? Getting hundreds of inquiries every year from strongly interested new prospects about your guitar lessons. Helping your prospects realize that YOU are the best and the only logical guitar teacher for them. Growing your business through referrals and word of mouth from your current students. Easily and consistently attracting guitar students from the 'past' to return to lessons with you. Becoming highly efficient at handling the day-to-day administrative tasks to have more time for yourself and for your students. Maximizing your guitar teaching effectiveness, so that your students get bigger and better RESULTS from you than they can get from any of your competitors. 1. They start their teaching business without even being aware of the 7 distinct areas they must focus on in order to succeed. 2. They don’t know ‘what’ exactly they must do to grow in the above 7 areas, let alone ‘how’ to actually do it. I'm not saying all this to scare you, I'm simply telling you ‘how it really is’. As a mentor to guitar teachers around the world, I understand exactly what challenges guitar teachers just like you face every day. The good news is that the steps needed to become massively successful in the 7 areas of your guitar teaching are quite simple to learn and can be successfully done by anyone. Likewise, all the common obstacles and challenges that guitar teachers face can EASILY be avoided (or resolved) with proper guidance, training and mentoring. If you have not yet reached your goals as a guitar teacher, realize that the reason for this has nothing to do with you or with your potential or with the economy or with any of the other factors guitar teachers typically blame for their lack of success. You are struggling because you are standing at the bottom of Mt. Everest, trying to climb it without knowing how to even take the first step. What you need is to have a proven trainer take you by the hand, train you on every step of climbing your mountain and then hold your hand all the way to the top… where your golden treasure chest is waiting. To start your ascent to the top of your guitar teaching mountain, read this page about guitar teacher training. Grow a massively successful guitar teaching business with guitar teacher training.